RF Code, Inc., a provider of enterprise-class active RFID technology, recently announced the addition of a new long-range mobile reader to its active RFID product suite. The new Bluetooth-enabled M220 reader was designed to bring automatic tracking and inventory capabilities to the mass markets of enterprise asset management. The M220 incorporates the desirable density and signal propagation characteristics of RF Code’s award-winning M-series product line in a portable and wearable form factor. RF Code, Inc., a leading provider of enterprise-class active RFID technology, recently announced the addition of a new long-range mobile reader to its active RFID product suite. The new Bluetooth -enabled M220 reader was designed to bring automatic tracking and inventory capabilities to the mass markets of enterprise asset management. The M220 incorporates the desirable density and signal propagation characteristics of RF Code’s award-winning M-series product line in a portable and wearable form factor. The M220 Mobile Reader can be used to aid in the discovery and management of assets in areas beyond the perimeter of a fixed reader infrastructure. It can also serve as a complementary search device within a dedicated, multi-zonal system featuring RF Code’s fixed readers. The M220 is a powerful solution in enterprise environments where customers demand the ability to search for a specific tagged asset or instantly inventory a group of assets. Solutions which leverage the unmatched combination of accuracy, long battery life, high throughput, long read range and room-level location capabilities of RF Code’s active RFID tags can now be architected for almost any mobile device; from smartphones to handheld computers to tablet PCs. The M220 Mobile Reader is a battery-powered, portable RF device which processes active RFID tag data and links directly to a Bluetooth-enabled computing device. The capabilities of the rugged, lightweight reader further enhance a user’s ability to monitor mobile assets or personnel. It is equally valuable for the performance of on-demand audits and field inventories. It can be worn on its companion belt clip, mounted in a vehicle, stowed in a pocket or used in a variety of ad-hoc applications. 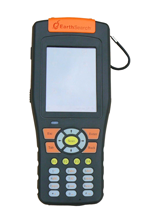 The benefits of mobile tracking and asset management have previously been limited to users of industrial-class handheld computers costing several thousand dollars. The M220 Mobile Reader interprets and reports the radio frequency messages emitted by RF Code’s M100-series active RFID tags at distances of up to 70 meters and reports signal strength information for each tag processed. Tag transmissions are processed in real time, which enables asset managers to quickly locate and identify tagged assets. With software applications from RF Code’s integration partners, almost any Bluetooth -enabled wireless device can be put into service as an asset tracking terminal (when paired with an M220 Mobile Reader). Windows Mobile handhelds, notebook PCs, ultramobile computers and business-class smartphones can now be empowered for asset tracking and management purposes. When used in conjunction with RF Code’s M100-series tags that include motion sensors, panic buttons, or infrared location sensors, the M220 can deliver real-time location, context and condition-aware data to managers in today’s most demanding markets.